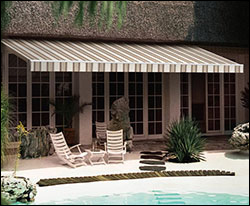 Lateral arm retractable awnings, or retractable patio awnings, are a modern version of the old storefront crank-up awnings of the last century. Tension arms and a roller tube are supported by a torsion bar. The torsion bar fits into brackets which are mounted to a wall or soffit. 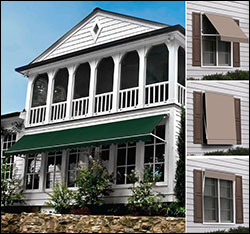 Hand-cranked awnings are still available, but motorized units are now most common. 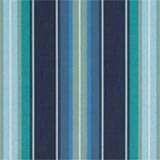 The motor is housed inside a tube, called a roller tube, which the fabric is rolled on. Many motors have a built-in receiver and are operated by remote control, home automation or a 3 way switch. Lateral arm retractable awnings are considered custom sun control products as they can be manufactured to exacting widths and an assortment of projections. Whether you are covering a pool or beautiful landscaped garden, it can be customized to fit your area. 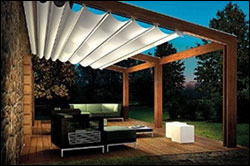 Although it is recommended that retractable patio awnings over 30′ be split and installed next to another standalone unit, they be as long as 40 feet or more in a single unit and extend as far as 18 feet in projection. These awnings also offer the flexibility to only open the unit as far as desired or adjust the pitch with the simple turn of a crank. 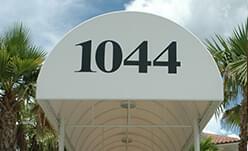 Retractable patio awnings typically utilize a solution dyed acrylic base fabric, which can be seen on the fabrics page. 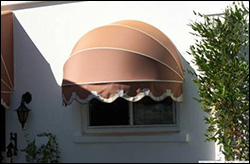 Drop, or side, arm retractable awnings are commonly used to shade a window or doorway. The main components can be expressed as a roller tube at the top, spring-loaded side arms, and a drive which can be in the form of a motor, crank or tape-pull. These shed style retractable awnings are appropriate for most any architecture and are still popular today using a more weather resistant fabric such as a solution dyed acrylic fabric. Drop arm retractable awnings allow for adjustable pitch at the touch of a button or turn of a crank and are ideal for covering small areas. 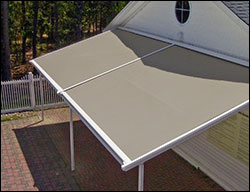 A ribbed retractable awning is also an excellent product for cover small areas like windows or doors. 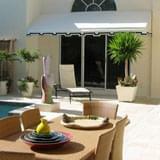 Unlike a drop arm retractable awning, these awnings have sides and can not be designed to utilize a motor. 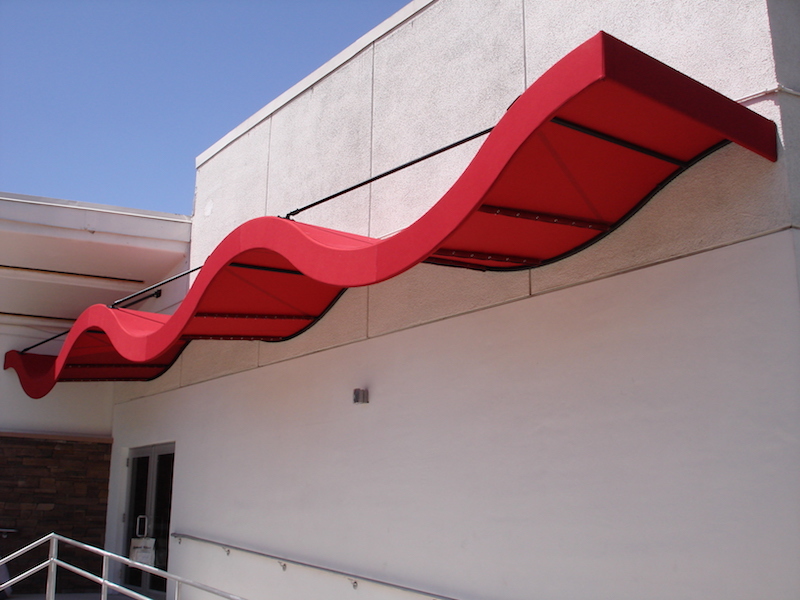 Like the other retractables, ribbed retractable awnings also perform best utilizing a solution dyed acrylic fabric. The retractable canopy is a 21st century version of a retractable patio awning because although the fabric is retractable, the structure is highly engineered to handle most any inclement weather. This system can be custom manufactured to widths up to 40′ wide by 30′ in projection and come in two unique designs, a fold up or roll up design. A fold up retractable canopy does exactly that, it folds up in the retracted position. In the extended position, a quality retractable canopy pulls the fabric taut to allow ample rain run off, keeping the covered area dry and protected from the weather. One downfall to a fold up retractable canopy is that it can retain dirt or trap debris as it is being retracted, requiring a little more effort to keep the structure clean. A roll up retractable canopy rolls the fabric on a roller tube and houses it inside a protected covering made of painted aluminum. Although this system is a little more costly when compared to a fold up retractable canopy, it does tend to be a bit more user friendly on the maintenance side. Both retractable canopies offer inclement weather protection at the touch of a button and can utilize most any awning fabric on the market today, making them the ultimate products of the retractable awning family. Because these canopies are all weather retractable products, make sure water management is considered when designing your next project as not all models incorporate a guttering system.